We know that green buildings and communities are only part of the solution to lengthening and bettering the lives of every person on the planet. That’s why the heart of the sustainability community’s efforts must go beyond construction or efficiency. Instead, our focus must be on people. The U.S. Green Building Council commissioned ClearPath Strategies, a global public opinion research company, to conduct in-depth national qualitative and quantitative research to listen to people’s views of the environment—a study whose breadth and detail that went much further than the familiar audience for LEED, including residential developers and young parents in five diverse, urban markets in the U.S. 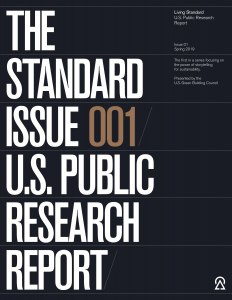 This is the first public Living Standard research report of an ongoing series where USGBC set out to better understand how the public feels about the issues at the core of the green building community’s mission—sustainability, green buildings, and the environment—and the power of storytelling to further our work in sustainability.